FIGURE 1. 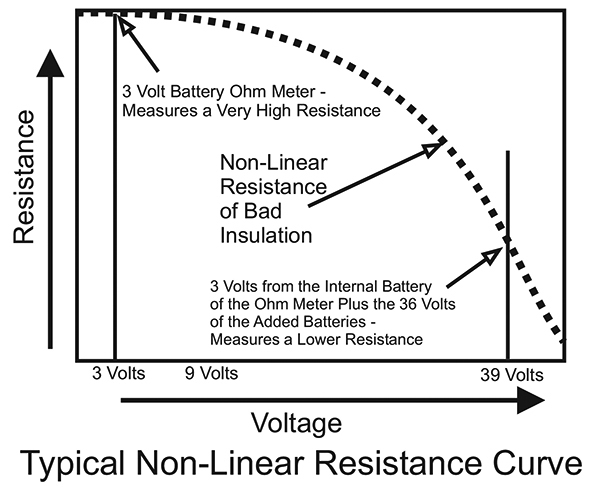 This chart shows how a non-linear resistance goes down as voltage goes up. 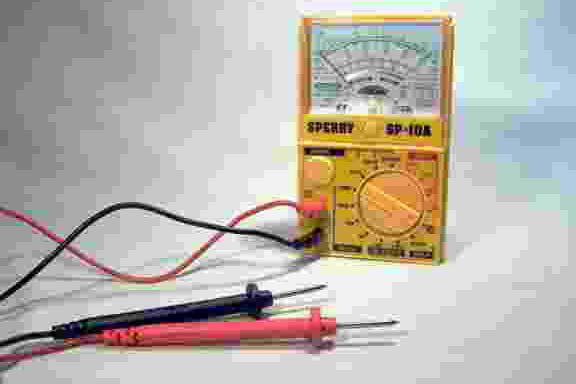 The voltage shown here would be the battery voltage of the ohmmeter. What I had come up with was not a new invention. It was a test instrument used by electricians called an insulation tester which is an ohmmeter with a high voltage internal battery. In the case of the meter assembly I had come up with, the voltage of all the batteries combined was about 27 volts: the three volts of the battery inside my ohmmeter, plus the 24 volts from the two added 12 volt batteries. Next, I tried an old fashioned analog meter that I had lying around. With the extra batteries, the numbers on the ohm scale weren’t accurate anymore, but I could deal with that. At least the needle on the meter didn’t move back and forth very much, and I could get a somewhat stable reading. Then, I thought about voltage. In general, fire alarm systems use 24 volts and I needed to test the wiring at voltages that were higher than that. The 36 volts from four nine-volt batteries seemed to be a reasonable voltage, and the four batteries could be strapped to the back of the meter, so that’s what I used. FIGURE 3. Batteries, battery clips, and resistor needed for the project. The limiting resistor (see Figure 4) makes up for the extra voltage of the batteries. That way, when the test leads are shorted together the ohmmeter will read zero ohms (like a normal ohmmeter). 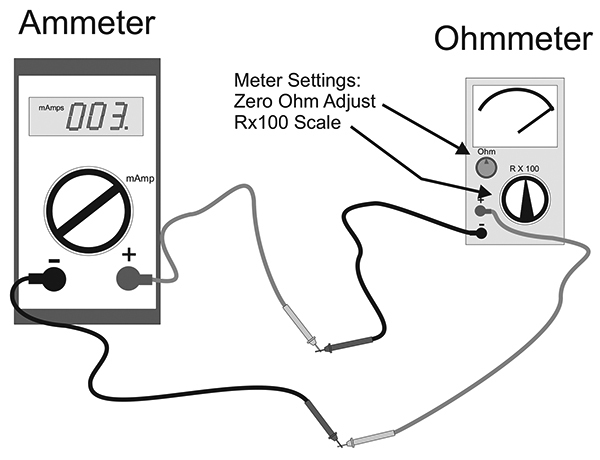 Before proceeding, make sure the ohmmeter is set to the highest ohm scale: RX100 or greater. This is the scale that is going to be used for all future measurements. FIGURE 4. Simplified schematic of an ohmmeter showing the addition of the 36 volt batteries and a limiting resistor. 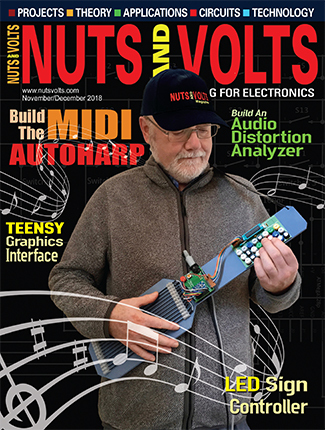 Measure the current generated by the ohmmeter by placing a digital milliamp meter in series (see Figure 6). The current measured on the ammeter is the current that the ohmmeter calls zero ohms. FIGURE 6. 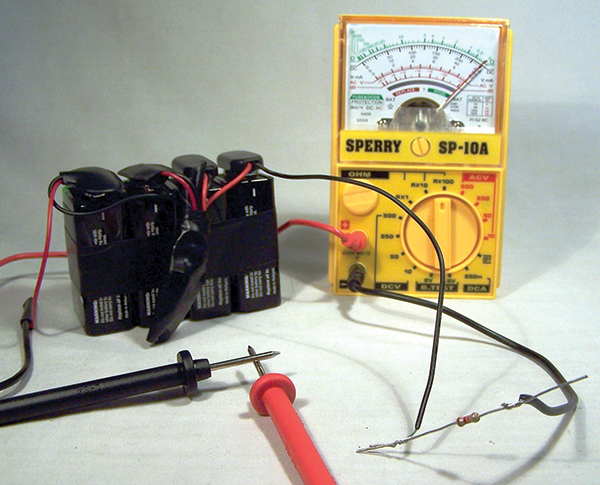 Setup to measure the current of the ohmmeter. My meter requires approximately 3 milliamps to indicate zero ohms. The Ohm’s Law formula (E / I = R) works out to be the 36 volt batteries divided by the .003 amps (3 milliamps) generated by the ohmmeter which equals 12,000 ohms for the limiting resistor. You can confirm this method has found the proper value for the limiting resistor by temporarily inserting the resistor into the meter circuit as shown in Figures 7 and 8. 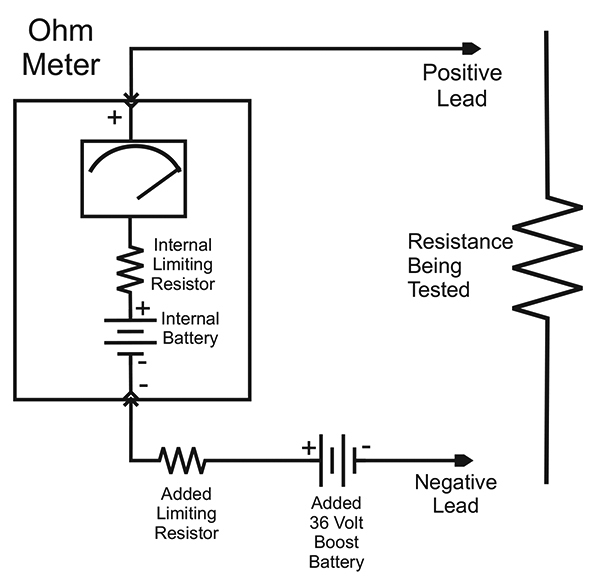 If the meter can’t be zeroed with the ohm adjustment on the meter, the resistance of the limiting resistor may have to be adjusted using the experimental method. FIGURE 7. Meter, batteries, battery clips, and the shorted test leads. FIGURE 8. 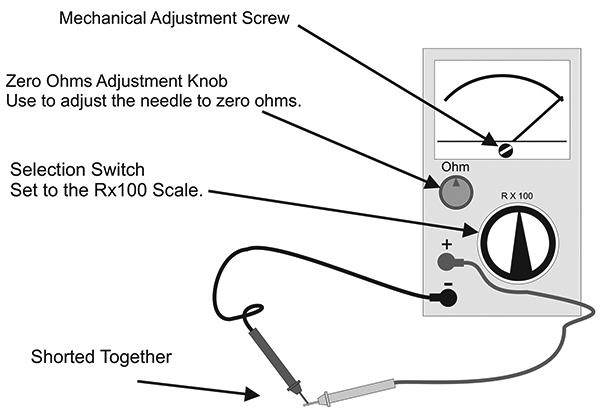 Electro-mechanical layout of all components in the insulation tester. FIGURE 5. Soldered test lead, battery clips, and resistor. Tape the limiting resistor and both soldered black test lead ends to the pigtail to give all solder connections mechanical strength. This meter is going to rattle around with the other tools in the tool box, and the solder connections need to be protected so they do not move and break. 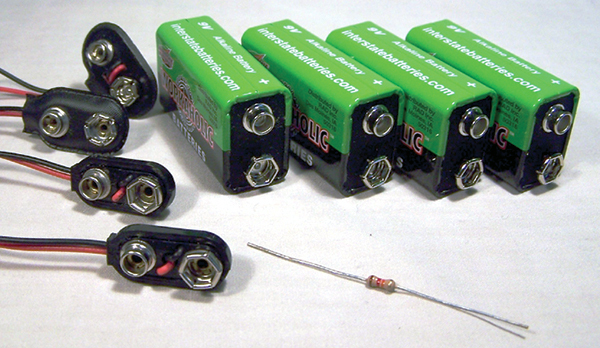 This assembly of the batteries and pigtail can be put in a plastic chassis box and then attached to the meter. Personally, I never found a commercial box that was both big enough to house the whole battery assembly and small enough to fit on the back of the meter, so I just used copious amounts of electrical tape to attach the assembly to the back of the meter. 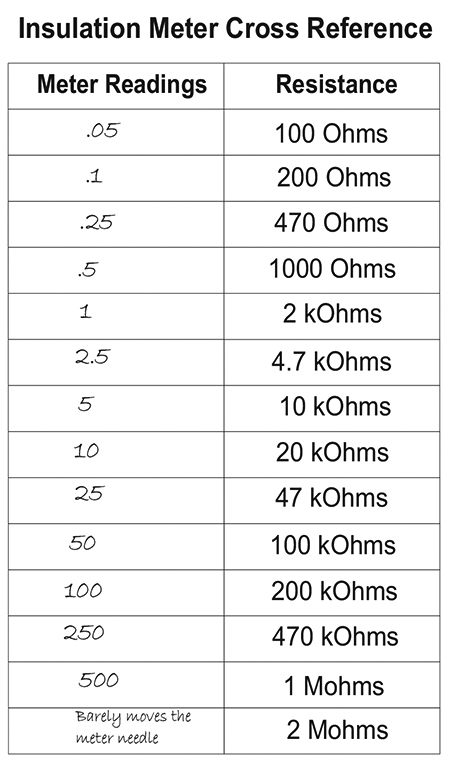 Ohmmeters use Ohm’s Law (Resistance = Voltage ¸ Amperage) to figure out the resistance of the device being measured. 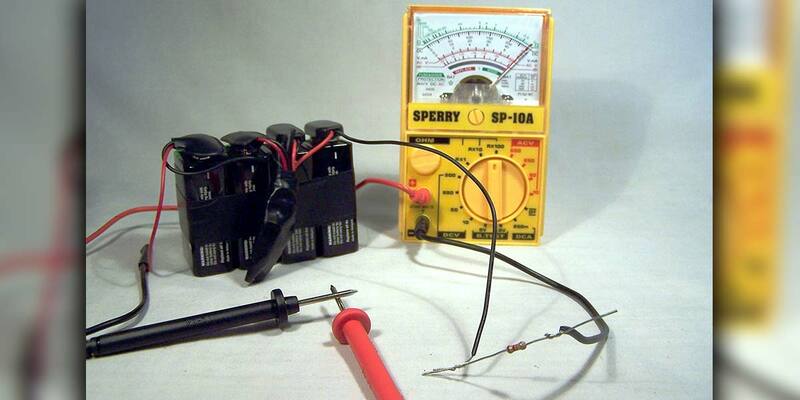 The voltage is provided by the meter’s internal battery and remains relatively constant. The amperage is the current through the device being tested; in this case, insulation on wire. On an analog meter (a meter that has a mechanical meter movement), the needle actually shows the amount of current through the device. It moves to the right as the resistance goes down and the current goes up. 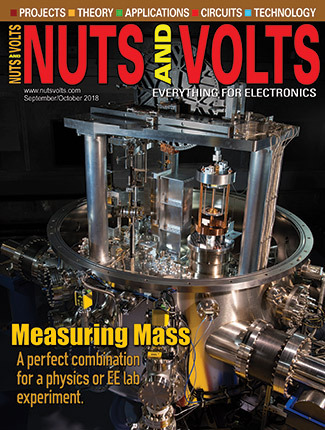 When the resistance reaches zero ohms (the leads shorted together), the current through the meter is at maximum and the needle is all the way to the right. The numbers on the face of the meter make up a conversion table or cross reference table. It converts the current flowing through the device being measured to the resistance of that device. The numbers on the meter’s face are then multiplied by the switch setting of RX1, RX10, or RX100 to calculate the total resistance being measured. A digital ohmmeter does this cross reference automatically; it converts the test current to resistance to give a direct reading on the display. With the added batteries and limiting resistor, the numbers on the face of the meter are no longer factory calibrated. For instance, a resistor under test with my ohmmeter may show 25 on the ohms scale. Normally, this number would be multiplied by 100 (RX100) to represent 2,500 ohms. My meter has been modified, so using a cross reference table I see that this resistor is a 47,000 ohm resistor. FIGURE 9. Cross reference chart. Just remember to use the RX100 setting on the meter for all resistance measurements. Also, keep in mind that the meter is now applying over 36 volts to whatever is being tested, so make sure there aren’t any delicate electronics in the circuit being measured. This modified meter is no longer a regular ohmmeter; it’s an “insulation tester.” With a meter like this, I have found wires where the insulation was partially rubbed off; I found a leaky lightning arrestor; I found wire to wire faults inside walls; and I found many instances of water damage. Any fault or conduction that a fire alarm panel detects with its ground fault detection circuit I can now find with this insulation tester. *If you have an old analog meter that isn’t being used for anything anymore, you can use it instead of purchasing a new one. All the meter needs is its internal battery and its test leads. ** Most of the resistors in the kit won’t be used except to calibrate the meter, and the resistors can be reused in future projects. 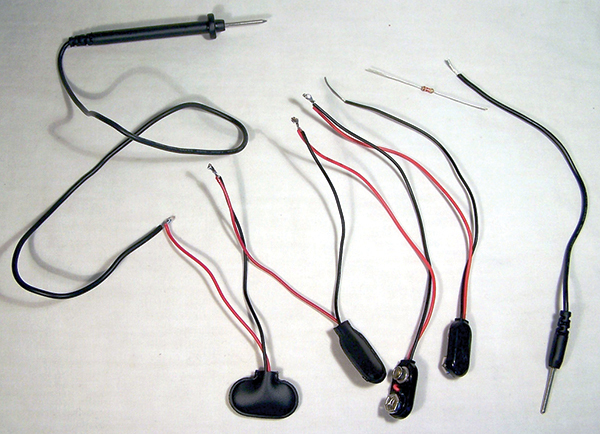 If you have a variety of resistors already, the resistor kit isn’t needed. 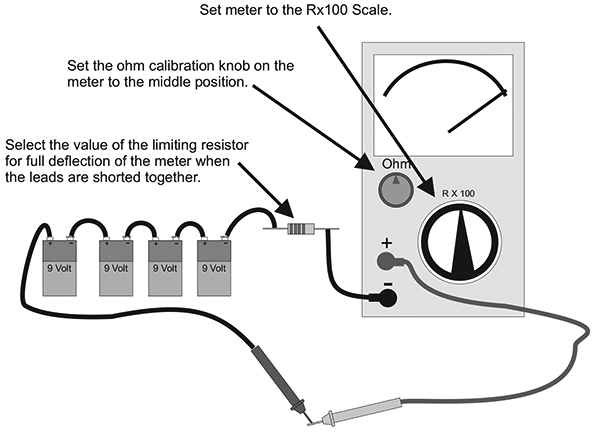 Method for calibrating an analog ohmmeter. They tried to use a regular ohmmeter to find the ground fault. I watched them. Right after sunset, while there was enough light to see the cityscape and the lit streetlights, I stood on top of the hill overlooking Duluth, MN. They were power company linemen and they had just driven up to a three-phase, 13,800 volt power pole across the street from a TV station which was off the air because of a power blackout. The lineman in the cherry picker used his ohmmeter to check for shorts in the underground line. A nine-volt battery won’t find much of a problem on a 13,800 volt power line, and that’s what was found — not much of a problem. Well, they put in a new fuse at the top of the pole, turned on the switch, and with the sound of a shotgun and a 15 foot shower of sparks, the fuse blew. All of the city of Duluth went black. There really was a short. A proper insulation tester using a 15,000 volt power source would have detected the problem. FIGURE A. Testing the resistance of a puddle of water. The probes here are about 1/2 inch apart and both of them are in the water. 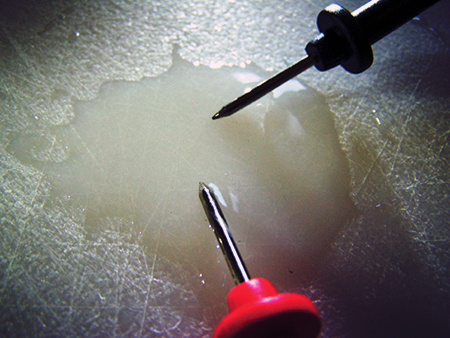 Use the insulation tester to measure the same water. Look up the actual resistance on the cross reference table and write down that resistance. The resistance measured by the digital ohmmeter and the resistance measured by the insulation tester will be quite different. The measured resistance of the control resistor should be about the same whether the digital ohmmeter is used or the insulation tester is used. 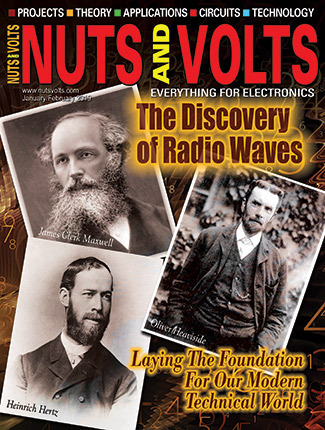 Water, on the other hand, has a voltage-based, non-linear resistance. 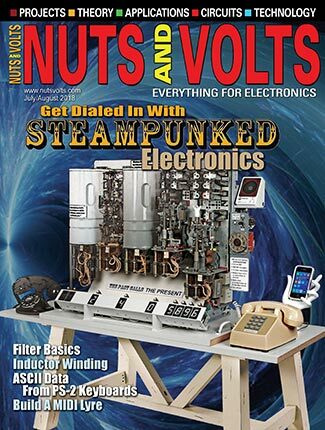 That helps explain why the insulation tester — with its high voltage battery — detects a definite problem the water on the insulation, while the digital ohmmeter — with its low voltage battery — shows uncertain readings.